Joint Session is a free live music showcase featuring poster artists from around the country, food trucks, and plenty of craft beer. Each guest will receive four tokens for 12 oz. beer samples from both Independence Brewing Company and Lagunitas Brewing Company. Bringing together the art behind the music, four of the top poster artists and screen printers from Austin and beyond, Billy Bishop, Lil Tuffy, Andy Vastaugh and Travis Bone, will be onsite selling limited edition prints. Nine Mile will showcase a lineup of indie and rock artists playing throughout the day. Resident food trucks will be serving up “tacos con chutney,” joined onsite by LeRoy & Lewis barbecue, and NadaMoo ice cream, with food available for purchase throughout the day. Austin’s biggest interactive, film, music, and comedy is almost here and we’re gearing up in a big way. We’ve got a week of events lined up at our new trailer, located in the heart of downtown to showcase some of our partners and give you a much needed dose of healthy. Take a ride with Peloton, March 10-11 // 9AM-2PM Experience Peloton, the cutting edge indoor bike that combines the best of fitness and tech. Pop in for a demo or get in a quick ride before your next panel. Caffeination station with La Colombe, March 10-19 // 10AM-5PM Introducing La Colombe at Snap Kitchen. Enjoy a complimentary Pure Black and Draft Latte for that coffee pick-me-up between panels. Nada Moo ice cream social, March 10 // 3PM-5PM Vegan ice cream? Nada problem. Treat yourself to something sweet and enjoy a scoop of NadaMoo coconut ice cream topped with our almond & sea salt dark chocolate. Stay chili with Beanitos, March 11 & 18 // 3PM-5PM Our chef will be serving up your new favorite Snap pairing: a bag of antioxidant and fiber-packed Beanitos topped with a scoop of Turkey or Vegan Chili, eaten with a spoon. Best of bananas with Barnana, March 10, 13, 17 // 9AM-11AM These dried banana bites are the perfect on-the-go snack to keep you fueled up through the fest. Take your first taste of Barnana at the Snap Trailer. Cure for the common hangry: RXBAR, March 11 & 12 // 9AM-11AM, 3PM-5PM, March 13 // 2-4PM A growling stomach shouldn’t cut your festival fun short. Our heroes at RXBAR will be at the trailer passing out their gluten free, soy free, dairy free, delicious full protein bars. Some like it hot. everyone likes Yellowbird, March 14 // 3PM-5PM Make our Brisket Hash all your own with a drizzle of a flavor or three from our favorite local hot sauce brand — Yellowbird. Parfait par-tay with Kokonut Yogurt, March 12 & 17 // 3PM-5PM We’re obsessed with this Austin-born coconut yogurt. Kokonut has it all: delicious & inventive flavors, clean ingredients, plus tons of pairing potential. Get a taste for yourself at our BYO parfait bar. Soothing sips with Nona Lim, March 14-16 // 9AM-11AM After days full of queso, BBQ, and booze, head over to the trailer for a cup of sippable Nona Lim soup that’ll nourish & satisfy without weighing you down. The bitter truth tastes damn good, March 16 // 3PM-5PM Our friends at Salud! Bitters will be shaking up Topo Chico mocktails. Their homemade bitters increase liver function, regulate blood sugar, and promote healthy digestion… AKA just what your body called for mid-fest. This was my fourth year at the Natural Products Expo West (past years’ coverage – 2014, 2015, 2016), a convention held every year at the Anaheim Convention Center where companies showcase their new natural foods and products to retailers, restaurants, industry folk, and press. Many companies launch new products at this convention, including many vegan and vegan-friendly products. Each year it is so exciting to see so many more vegan options at the Expo! This year was no different, and there were so many new vegan finds I can’t wait to share with you! 1. Daiya Pumpkin Spice Cheezecake – This was the best thing I put in my mouth all Expo!! As you probably know, I am obsessed with all things pumpkin spice, so this was the product I was most excited for and it did not disappoint! It was creamy, dreamy, and had just the right balance of sweet and pumpkin spice. This will be a seasonal product, so look for it this fall! 2. Follow Your Heart New Yogurt – There were A LOT of vegan yogurts at Expo this year, but the best I tried were from Follow Your Heart! They are made from a coconut base and full of real fruit and probiotic cultures. They are soy-free, gluten-free, and non-GMO as well. The consistency of FYH’s yogurts was perfect and I loved the real chunks of fruit in some flavors. The variety of flavors was awesome, and they included Strawberry Rhubarb, Key Lime, and Pina Colada! Look for these in stores early this summer! 3. Field Roast Mini Corn Dogs – Field Roast had so many new vegan products this year (check out more below!) that it made it tough to choose a favorite, but these mini corn dogs totally won my heart! They had the perfect batter-to-hot-dog ratio, and the batter itself was delectable! They are made with Field Roast’s own Frankfurters, so you know they are good! These will be in stores later this year – look for them in the frozen section. 4. Upton’s Naturals Ch’eesy Bacon Mac – This prepared vegan mac and cheese only takes one minute to prepare (the pasta is already cooked!) and has an incredible smoky flavor. I really liked the nice firm al dente bite of the pasta. Definitely a winner and I can’t wait for it to hit stores! Their other new products (check ’em out below) are delicious as well! 5. Miyoko’s Kitchen Smoked VeganMozz – I didn’t think Miyoko’s could get any better, but this smoky vegan mozzarella blew my mind! The flavor is unbelievable and I can’t wait to get my hands on some of this stuff! It is gonna elevate breakfast sandwiches, pizzas, grilled cheese, and so much more! 6. Nature’s Charm Vegan Sundae Sauces and Coconut Whipping Cream – Nature’s Charm are coming out with three new coconut-based dessert toppings – butterscotch, salted caramel, and chocolate fudge – plus a new coconut whipping cream! I could not get enough of these toppings and can’t wait to have vegan ice cream sundaes topped with their coconut whip and sauces. 7. NUCO Coconut Vegan Mayo – There were a few new vegan mayonnaise options at Expo, but NUCO’s coconut and avocado oil based mayo was my favorite! It had a fantastic creamy texture, just the right amount of fat to give it a good mouthfeel, and it had a great tangy taste! Plus, it is made with clean ingredients with no weird additives. 8. Vegetarian Plus Tuna Rolls – These vegan tuna rolls come in two individually wrapped rolls, and you can make all sorts of thing with them. The chef at the Vegetarian Plus booth made these incredible spicy vegan tuna rolls and I stood there for a few minutes sneaking several samples. They taste so freaking good, I can’t wait to make my own sushi rolls with them! Vegan sushi party, anyone? 9. Violife Vegan Cheeses – Like past years, Violife’s cheeses were a real standout of Expo! I tried their new after-dinner dessert cheeses stuffed with blueberries and cranberries as well as sampling some of my old favorites (like their parmesan!!) and loved everything. 10. Milkadamia Latte Da – Milkadamia was my favorite beverage at Expo last year, and now they are releasing this incredible latte drink! I tried a cappuccino they made with it, and the caramel and marshmallow flavors were delightful! NadaMoo Birthday Cake and Rockiest Road Ice Cream – These two new flavors were released a month or so before Expo, but I haven’t been able to find them at my local Sprouts grocery store yet, so Expo was the first place I got to try them! They were both phenomenal! The Birthday Cake had ribbons of yellow cake, chunks of cookie dough, and rainbow sprinkles in the vanilla ice cream, while Rockiest Road was chocolate ice cream studded with almonds, cookies, and fluffy marshmallows. Both flavors were incredible and I can’t wait to find them at my local Sprouts! Follow Your Heart Rocket Cakes and Ready-to-Pour VeganEgg – Rocket Cakes is a brand new, ready-to-pour on the grill liquid pancake batter that will make vegan pancakes even easier to make! They were also showcasing their pre-mixed liquid VeganEgg in a container that is easy to pour. Both of these will be released in the fall. Daiya Deluxe Cheeze Sauce – Just the cheese sauce (the same that is sold with their mac and cheese) will be sold in packets of three so you can douse your veggies or make nachos! I tried some at Expo with some chips and it was delicious. It will be available in both their Cheddar Style and Alfredo Style flavors. Field Roast Chao Mac and Cheese, Fruffalo Wings, Katsu Cutlets, Chao Buttery Spread, and Chao Mayo – OMG, Field Roast is releasing so many RAD new products and they all taste amazing! The mac and cheese was fantatic and uses penne pasta and comes in Original and Chili flavors. The Buttery Spread tasted amazing on bread and the mayo had a nice creamy taste. And drooling over the Katsu Cutlets and Fruffalo Wings! They also had three seasonal sausages – Hawaiian, Bratwurst, and Lil’ Smokies! Upton’s Naturals Ready-to-Eat Meals and New Jackfruit Flavors – Upton’s unveiled four new shelf-stable vegan meal kits that feature pre-cooked noodles and real vegetables that are ready in just one minute! They are available in the following authentic Thai flavors: Massaman Curry, Pad See Ew, Thai Spaghetti, and Thai Curry Noodle. They also debuted two new jackfruit flavors, Sweet and Smoky (which is perfect for those that want a subtle BBQ flavor) and Sriracha! Myrtle Greens Vegan Jerky – I was pleased to see so many vegan jerky options at Expo, but my fave was the jerky from Myrtle Greens (who are affiliated with Vegetarian Plus). I loved Vegetarian Plus’ jerky last year, and I think these might be the same ones re-branded. I’m hoping these finally hit stores this year! Bute Island Foods Sheese – This was my first time trying this Scottish vegan cheese that so far has only been available in Europe. It was soooooo good and they have so many different flavors. They were trying to find U.S. distribution at Expo, so I’m really hoping they get some buzz going so we can find it in the U.S. soon! This week’s best of series focuses on all things vegan snacking. So when I say vegan snacking, I wanted to share the best of great snack ideas not genetically modified *clears throat* crap that coincidentally is vegan like Oreos. I wanted real, vegan and gluten free snacking. I wanted to cover chips to ice cream and everything in between so everyone from sweet to salty palates are covered. As clean as your eating is, it’s important to build in treats or desserts into your diet. Balance is key. I shared favorites that are all gluten free and vegan. Easily found at Whole Foods or your favorite markets (or online). This is just a list of my top favorites and honestly the list could go on & on if you let me. Let’s start with popcorn. I truthfully have a strong love for popcorn. This popcorn in particular is my kryptonite. Live Love Pop Truffle popcorn is based out of Austin, Texas. A phenomenal company that is also sharing a 20% off discount for friends of mine on their new online shop. Use code: Kneadtocook for 20% off your order. The truffle salt is our absolute favorite! Siete tortilla chips are grain free, vegan and gf. These are staples on our Taco Tuesday bar. The flavor is far superior to anything on the market and these are so addictive! These are bit pricier than your basic chips but oh so worth it. Trust me. And they also have tortilla wraps (one that is vegan) that are so good as well. Let’s get into dark chocolate & of course, nut butter. MY love. Justin’s has long been a favorite of mine. This little bag of delectable goodness are perfect for snacking, topping ice cream OR in baking. No words needed. Just go and get these! Who needs dairy ice cream? NOT me! Once you sink your spoon into Nadamoo’s coconut based ice creams… there’s no turning back. They just released two new flavors which I’m still dying over! Needless to say the product they sent us was quickly devoured. Thankfully local markets can order for us. The birthday cake cookie dough. Really, this is the best food combination in the history of food combinations EVER. Moving on… baked coconut chips. I bought them on a whim one day at the grocery store and have worked my way through many brands but THIS! Oh C20 you make the most delectable flavors, texture and such yummy goodness. I love these atop smoothie bowls, on my oatmeal or straight outta the bag 😉 Available at most grocery stores near the healthier chips/snacks. Totally addictive. Be warned. Relieve PsA Pain with an FDA-Approved Treatment. Ohhhhh Hippeas. I stumbled on these vegan puff kinda snacks at Starbucks and we instantly fell in love. My daughter love the fajita flavor and I of course am smitten with Sriracha. You can order right from Amazon and they ship you a love, huge box of love. Crunchy. Flavor packed. Oh and they’re made from chickpeas so yeah, they have protein too! I die. If you’re a caramel fan like me… this is one thing that you miss going vegan. Until now. These Cocomels caramel candies are made from coconut milk and are oh so creamy deliciousness. Perfect grab and go treat that are pre-wrapped. They are perfect when you just need a sweet treat. Eat Pastry has long been a favorite in our house. First, you can eat the dough right out of the container (ha – no eggs in there). They make a gf version. You can mix the dough into ice cream. Spread it on whatever. However you do you! Plus of course, you can bake them if your a traditionalist. I buy these by the case and store in the freezer. Plus the dough is ready to go if you wish to only bake 1 or 2 cookies. I mean seriously, c’mon! Happy National Frozen Foods Day! Did you know Frozen Foods Day has been celebrated all the way back from 1984? I’m sure majority of your grocery shopping trips make a pit stop to the frozen aisles for at least one item, if not more. The frozen aisle has definitely improved over the years. I like to bring this question up in many of my nutrition group discussions – Which do you think is healthier: fresh or frozen? Many raise their hand for fresh and a few brave participants raise their hands for frozen, even if they don’t exactly know why. The answer is both are healthy! Frozen can be just as healthy as fresh thanks to American inventor Clarence Frank Birdseye II, who invented the process of flash freezing. Flash freezing of fruits, vegetables, meats, and seafood preserve flavor, quality, and nutrients. Birdseye discovered the key was freezing the food quickly, locking in foods nutritional value. Flash freezing forms small ice crystals which prevent the cell walls from bursting. Large ice crystals turn the food to mush. Previously working as a supermarket RD, I know how to navigate the aisles like a pro! Let’s first shop by food group. Check your ingredient list. Make sure it is just the fruit itself. Avoid added sugar. Tip: Skip the syrup for topping your waffles or pancakes. Try using frozen fruit! Simply add frozen berries to a small pot over stove top and let simmer. It will turn gooey and syrupy. Add a teaspoon of chia seeds to thicken. Opt for the plain varieties. Skip the vegetables with gravies, cheese sauces, and even those labeled as “lightly seasoned”. They may be light in taste but check the nutrition label for hidden excess sodium and fat. Watch out for “par-fried” items. I’m looking at you frozen french fries. Par-fried means blanching or half-frying that involves partially frying the food but not browning it, so that it must be cooked again before serving. So even though you might bake them in the oven, they were still fried. Look for new items like riced cauliflower and other riced vegetables. So far I’ve seen riced carrots, broccoli, and sweet potatoes too! Cauliflower is popping up everywhere for a low-carb option. They are even making cauliflower tots to replace potatoes. Tip: Give yourself a break prepping in the kitchen. Get a stir fry going in minutes with pre-chopped onions, peppers, and carrots! Look for the first word on the ingredient list to be the word “whole”, for frozen products like waffles. Now ancient grains are even easier to get on the dinner table. No need to wait for them to cook in a pot. Warm up frozen whole grains like brown rice and quinoa. Do steel cut oats take to long to cook in the morning? Don’t worry there is frozen version that can heat up in seconds. Again, watch out for “par-fried” items. Opt for protein, like chicken or fish, without a breadcrumb coating. Choose lean choices of meat. Look for plant-based proteins like edamame. Now they even have frozen beans available! This is typically your ice cream section of the frozen department. There is a whole other refrigerated aisle dedicated for wholesome dairy products like milk, yogurt, and cheeses. Check your ingredient list. Look for real food ingredients. My Picks: As a dietitian, I always practice what I preach that everything in moderation. Now if you want that Ben and Jerry’s, go for it, being mindful of the portion sizes. There are so many new ice creams out there that I do have mixed feeling about. Some have sugar alcohols. For me personally, they bother my stomach, but it can be a good alternative for ice cream lovers who are looking to enjoy their ice cream a little more often than not. Halo Top, NadaMoo, Yasso, Enlightened are a few. In general, look for meals that include one or more servings each of vegetables, whole grains, and lean meat, fish, or poultry. This combination will be higher in vitamins and minerals as well as fiber (which helps fill you up). Skip frozen dinners with cream sauces, gravies, or fried foods. And although dessert may look like a bonus, maybe have a piece of fresh fruit instead, for more fiber, nutrition, and fewer calories. When comparing labels for frozen entrees, many eyes jump right down to the sodium, because come frozen meals can be sodium bombs. Look for a frozen entree < 600 milligrams. It’s also important to pay attention to serving sizes. Although they may be lower in calories, smaller entrees may leave you hungry. But don’t be afraid to add a few extras to boost nutrition and satisfaction. Add a side salad or an extra bag of steamed veggies to up nutritional value of the meal and add fiber, so it will fill you up and satisfy your hunger. Looking to bump up the protein? Add 1/2 cup of beans or a sprinkling of nuts to your meal. No additional cooking required! My favorite trick: I place a big bed of baby spinach or zoddles on my plate then pour the piping hot Luvo frozen entree right on top straight from the microwave. It wilts the spinach or softens the zoodles and bulks up the meal with extra vegetables. Check your serving size. Often those pizzas contain multiple servings. Again, bulk them up! Keep it simple so there is no additional cooking required. Add toppings like frozen grilled chicken strips and plenty of veggies. Also, look for pizzas that use whole grains in the crust. My favorite trick: I pile my pizza high with extra veggies. (The more the merrier!) When there is about 5 minutes left until the pizza is done, I crack a few eggs right on top and finish cooking the pizza to add an extra veggie and protein punch. Plus, who doesn’t like a runny egg yolk? Check your ingredient list. Make sure there are actual vegetables in there! Don’t be fooled by packaging. Just because there is no animal protein in it, they can skimp on the veggies. Some veggie burger contain fillers like rice and potatoes to bulk it up. Look for a veggie burger with plenty of vegetables on the ingredient list. It all began in Austin, Texas the year of 2004 with coconut milk based ice cream made in small batches for dairy-free friends and family. Ever heard of the term have fork will travel? Well for ice cream lovers it’s have spoon will travel! The news spread like wildfire at how cool and creamy their ice cream was and random people showed up on their doorsteps with spoon in hand and that’s how NadaMoo was born! NadaMoo is a phrase that means “no dairy”. which is unique and surprisingly delicious with it’s cool creamy concoction! So why coconut milk? Not only does coconut milk provide a rich creamy texture the saturated fat is different than the saturated fat that is in animal foods. The saturated fats in whole dairy products and meats for some causes the liver to produce way too much cholesterol where with the intake of saturated fat found in coconut milk to have any harmful effects. NadaMoo ice cream is concocted with a dairy-free coconut milk base that is super creamy made from high quality organic ingredients that develop unique flavor profiles. I recently made the choice to go dairy free and it sure has been a struggle because there’s nothing that I enjoy more than cool & creamy ice cream on a hot summers day to cool down with whether in a cone or in a dish it’s a treat that can’t be beat! I have tried non dairy desserts before and some I have liked but lacked in texture almost chalk like. I had the pleasure of trying NadaMoo! Non dairy ice cream to try out for review and couldn’t wait to try them to see how they differed from other coconut milk based ice creams I’ve tried. Would it be gritty? Icy? Or would it be creamy? The flavors that I chose to purchase at Whole Foods Market was the Vanilla, Chocolate, Maple Pecan, and Mint Chip. What I loved about the Maple Pecan ice cream was the fact that it offered a slight crunch from the salty yet toasted pecans that pop in your mouth and the maple flavor was outstanding! It didn’t offer a subtle sweetness of maple it was the real deal like when you pop open the lid you wan’t to make waffles sort of thing and then top it off with NadaMoo’s maple pecan ice cream for good measure ! Tastes just like a Mounds candy bar only melted! Decadent fudgey chocolate that resembles a hollowed out chocolate Easter bunny but in the form of ice cream and topped off with a chocolate chip cookie for good measure.. of chocolate! Gotta Do Chocolate ice cream was super creamy in texture and offered that rich chocolate flavor with a subtle sweetness of coconut! Refreshingly cool mint ice cream with morsels of chocolate chips in a creamy concoction. NadaMoo! Lotta Mint Chip is hands down the best ever non dairy dessert I have tried! I love that it offered a creamy texture and not icy like the other one I have tried was it offered that real refreshingly cool mint flavor with morsels of chocolate chips! What goes better with vanilla ice cream than a slice of cake with chocolate frosting? Vanilla cake with chocolate frosting and a scoop of cool creamy vanilla ice cream make for a special treat! Look at those specks of vanilla bean! Vanilla…Ahhh is the perfect way to describe the flavor it’s sweet, it’s creamy, and the perfect topping for a chocolate frosted cake! The Nada Moo flavors that I chose to taste were amazingly delicious and I am so glad I got to try them because they were that good! I have tried other coconut milk based ice creams and their texture was a bit on the chalky side whereas NadaMoo! is creamy like real ice cream that melts in your mouth on a hot summers day for a refreshing sweet treat! Each flavor was unique in their own creamy way the mint chip offered the perfect balance of mint flavor to chocolate chip ratio, the vanilla was very creamy with specks of vanilla bean throughout each bite, the maple pecan was buttery from the maple and crunchy from the pecans and the chocolate was super chocolaty like eating a candy bar only melted! I received no compensation for this post but was provided with samples of NadaMoo to facilitate this review in exchange for my honest opinion which in fact are my own. Expo West has three thousand-plus exhibitors, 77,000 attendees and a jam-packed education schedule. It’s almost time to gather in Anaheim for organic, non-GMO, health and doing business for good. Let Natural Foods Merchandiser help you find your way around with the tips below. To ease traffic going in and out of the exhibit halls, you need to present a badge and ID to enter the Anaheim Convention Center, not the show floor. Look for designated entry doors. Exhibitors and Super Pass holders have separate entrances. You will also need your badge to enter education sessions and on-site events. It will be extremely congested near the convention center and parking will be limited this year because of construction and expanded on-campus activities. To avoid the chaos, we recommend parking for free at nearby Angel Stadium. Free shuttles are available throughout the day from the stadium to the Anaheim Convention Center and back. To take the shuttle from the Convention Center to Angel Stadium, load near Katella Avenue (by the Arena). Bonus: Avoid on-site registration lines by printing your badge at Angel Stadium after you’ve parked. Yes. Full-service registration will be available at the Hilton and education upgrades are available at the Marriott. While this service is available, Expo West organizers recommend registering staff before you arrive at the show to save time and avoid lines. If you do need to register someone on-site, don’t forget to bring valid business proof and identification. The show floor is expansive, so it’s best to plan your route in advance.With all of the new exhibitors, though, you might need reading glasses to navigate by map. For ease, we recommend downloading the Natural Products Expo West/Engredea app for your phone or tablet. With the app, you can access the Exhibitor List, education schedule, events and a navigation tool, all while on the go. Get the app at m.expowest.com. Is it hard to find places to eat while at Expo West? There are restaurants nearby (think Cheesecake Factory, Anaheim Brewery, Joe’s Crabshack) but they fill up quickly. If you’re planning a dinner outing or team meal, call ahead and reserve space. If you need a quick bite to eat, the Hilton Food Court across from the convention center might satisfy your need. Pull up your favorite ride sharing app and get a ride to the Anaheim Packing House, 440 S. Anaheim Blvd. The food hall features several restaurants, bars, shopping and live entertainment. Downtown Disney makes for a nice walk or short ride, too. Children 16 and younger are allowed to attend Natural Products Expo West, but they require a children’s badge and adult supervision. The cost for a badge is $25. If you need child care on-site, this is also available for $25 a day. To register, print badges or check children in to child care, go to the Hilton, Lower Level. Registration and badge pickup lines have been difficult in the past. Will it be easier this year? Yes! Lots of new registration areas have been added across the Expo West campus. Three examples are the Arena Box Office, the Hyatt Hotel and Angel Stadium. Additionally, keep an eye out for mobile registration carts. If badge pickup lines get busy, the mobile carts will roll that way to scan confirmation barcodes and print badges. Attendees are limited to one sample bag per day. If you find that you’re getting too many samples to fit in one bag, encourage exhibitors to ship samples to you. This way, you don’t have to lug bags of food on the airplane and you’ll make sure to have the exhibitor’s contact information if you plan to place an order post-show. If you still have more than one bag at the end of the day, don’t worry. New Hope Network will donate the food to local food banks and charities, so it will go to a good cause. What are Expo West essentials? Water! Business cards. Expo West/Engredea app. Phone charger. Comfortable shoes. Snacks.NFM. Is there anything new for Expo West 2017 I should know about? The Hot Products show floors have expanded to include both the Hilton and Marriott this year. The exhibits will open a day before others and run March 10-12. If you see an “H” listed as a booth location, it means the exhibitor can be found in the Hilton; and “M” refers to the Marriott. The Super Pass is also returning. Even if you’ve already purchased a badge, you can log in to your registration account and upgrade your badge to get access to things like education sessions and a VIP Lounge with an electronics charging station. If you’re looking for the best way to plan your expo schedule, then head over to your phone’s app store to download the official Natural Products Expo West app. If you’re an iPhone user, open up the app store and type “natural products expo” into the search bar located at the top of your screen. Second, click “get,” then “install” and then type in your iTunes password to download the app. The next step is to open up the app. Once the app is opened, press “continue” to enable notifications, then “enable services” in order to get full use of the app. When that is done, sign in with your badge number and ZIP code (or use the app as a guest by pressing “continues as guest”). The Expo West app allows users to create their own schedule of events, view a map of Expo West, check out a list of exhibitors and so much more. If you’ve followed all the previously mentioned steps, you are all set to explore the app and create your ideal expo schedule. Kat Myers and the Buzzards: A mix between rock and roll and the blues, Kat Myers and the Buzzards is a band right out of the classic rock archives. This performance on Thursday evening is sure to set the stage for a weekend full of good vibes. This trio uses its minimalistic setup to immerse fans in some feel-good music that is guaranteed to get you dancing. 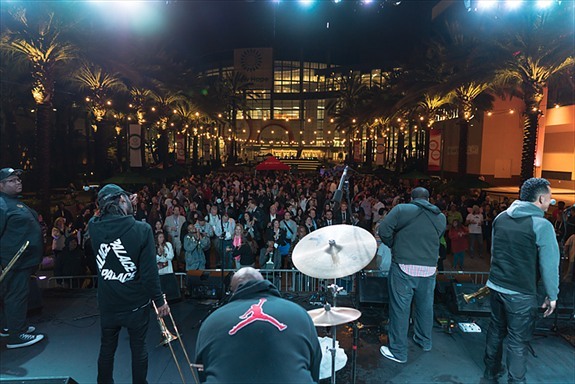 Be sure not to miss them on the Grand Plaza Main Stage on Thursday, March 9, from 6 to 8 p.m.
See-I: Washington, D.C., natives and brothers Zeebo and Rootz Steele have been sharing their influential reggae music with the world since the 1980s, and now they are bringing their talents to Expo West. Unwind with See-I Friday night, March 10, as the Southern California sun sets on a full day of Expo West. You can be sure that there will be lots of dancing and fun at this event on the Grand Plaza. Show your best moves from 6 to 8 p.m. The Funky Meters: What started out as a friendly jam at the New Orleans Jazz and Heritage Festival in 1989 turned out to be the grounds for the formation of the band The Funky Meters. Their music can be described as a combination of funk, blues and dance grooves with a hint of rock and roll—a combination that’s sure to get you on your feet dancing the night away. Be sure not to miss The Funky Meters from 6 to 8 p.m. on Saturday, March 11, at the Grand Plaza Main Stage. Climate Day at Expo West is sure to be jam-packed full of big thinking and tough conversations as thought leaders give keynotes about climate change, networking with other professionals concerned about climate change takes place and attendees take part in the climate awards ceremony. Be sure, though, to stick around (or join in) as the day caps off with a film screening of Kiss the Ground. Two acclaimed documentary film production companies have partnered with the nonprofit Kiss the Ground to share the story of Earth’s foundation—soil. The film preview and question-and-answer session take place from 6:30 to 8 p.m. Wednesday, March, 8, in Marriott Ballroom E.
Don’t stress out at Expo West—recharge and unwind with early morning yoga under the beautiful California sun. Held on the Grand Plaza Main Stage, you won’t want to miss out on this opportunity to stretch your muscles and clear your mind. Awake and find your bliss from 7:30 to 9 a.m. Thursday, Friday, Saturday and Sunday mornings (March 9, 10, 11 and 12). 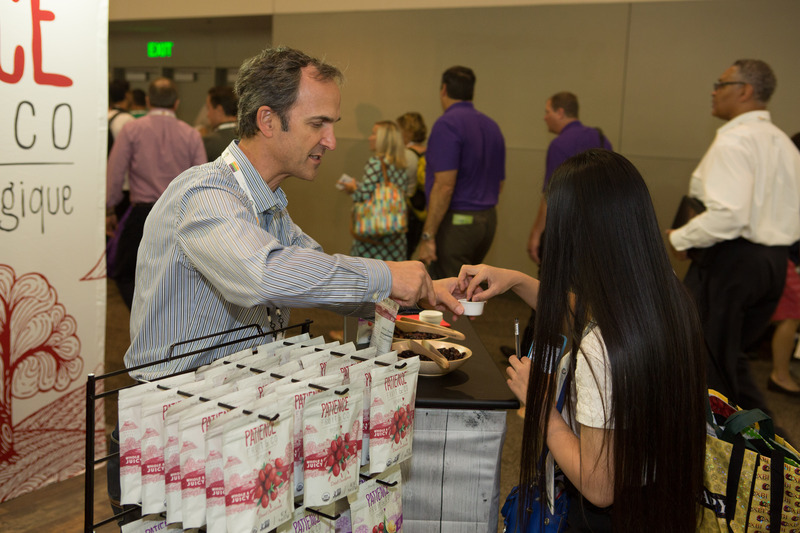 Sorry, samples will not sustain you for all of the networking, learning and product perusing you will do at Expo West. So to offer a little more sustenance on the Anaheim Convention Center campus (and the added bonus of being out under the California sun), The Park debuts this year in the Sheraton Parking lot behind the Hilton. Here you will find food trucks open from 8 a.m. to 6 p.m. Thursday through Saturday and from 8 a.m. to 4 p.m. Sunday. Natural brand trucks include: Nature’s Bakery, Nadamoo, Hippeas, Chefs Cut Jerky, Sundown Naturals and Vital Proteins. Chobani, Vega, 4th and Heart, and Enjoy Life Foods will park alongside four Orange County-area food trucks to serve show attendees in the Grand Plaza. In the Convention Center, concession stands offer varied menus, including organic options, in the hall B/C breezeway and in halls A-D. Hours are 10 a.m. to 6 p.m. Friday and Saturday and 10 a.m. to 4 p.m. Sunday. Across the plaza, the Hilton has a small food court including Sbarro, Baja Fresh Express, Just Grillin’ and Submarina. And both the Marriott and Hilton have Starbucks outlets with small grab-and-go offerings. Prepare for long lines. Grow your organic offerings easily by strolling the Fresh Ideas Organic Marketplace. This single-afternoon event features solely organic products. Find unique exhibitors that will only appear at this event among others who will appear on show floors later. Join in under the big white tent next to the Marriott from 12:30 to 5:30 p.m. on Thursday, March 9.